Ulsan, 21 June 2016. 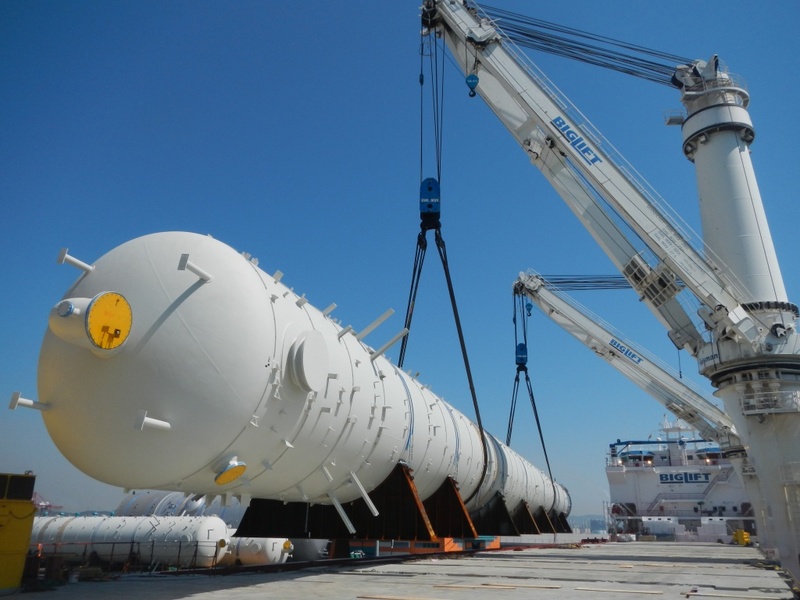 In the South Korean port of Ulsan, the first delivery of heavylift and oversized equipment has been made for ethylene cracker unit to be installed at the ZapSibNeftekhim polyolefin production facility, which is currently under construction. While certain types of equipment for ZapSibNeftekhim are not produced in Russia and have to be sourced from abroad, others are being manufactured locally at Uralkhimmash, Kamkabel and ZAVKOM Industries. Equipment delivery contracts have been signed with companies from over 35 regions across Russia. 1st Ulsan shipment includes five columns, including two C3-splitters which are 106 meters long, 6.8 meters in diameter and weighting 917 tons each. The equipment is being transported on a unique ship equipped with two heavylift cranes with a lifting capacity of 900 tonnes each. The ship is designed under Arc 4 ice class, which is fit for sailing via the Northern Sea Route. The equipment has been shipped by sea through the Indian Ocean and the Suez Canal, from where it will travel across the Arctic Ocean to the transshipment ports along the Northern Sea Route. In those ports, the columns will be transshipped onto special barges for further delivery to the industrial port of Tobolsk down the Ob’ and Irtysh rivers. During the 2016 Arctic navigation season, four ships are expected to arrive carrying 58 units of heavylift and oversized equipment from South Korea, China, Japan, Italy and Germany with a total volume of 60,000 freight tonnes. The delivery will be managed and handled by the Russian companies Deugro Projects, Volgo-Baltic Logistic, Central Marine Research Institute, Belfreight, Sovfracht, Morwenna Shipping Company, Ob Irtysh River Shipping Company, Mammoet Rus and others. In 2017, railway and air transport will be used as well. Once onshore, the equipment will be loaded onto self-propelled module transporters (SPMT) for further carriage to the ZapSibNeftekhim construction site. To make the transportation of heavylift and oversized equipment possible, special infrastructure has been set up in Tobolsk: the industrial port revamped, parking spaces and interim equipment storage sites prepared, the transportation route and enroute power transmission lines rearranged, detour roads designed and built to enable the convoy to bypass various utilities and railway infrastructure.